At least five Palestinians were injured by Israeli forces’ gunfire as they suppressed the weekly naval march in the northern besieged Gaza Strip, on Tuesday afternoon. Medical sources confirmed that those injured were transferred to the Indonesian Hospital for medical treatment, while a Palestinian driver of a bulldozer, who was among injured protesters, was transferred to the al-Shifa Hospital, as he was in a critical condition. Palestinian protesters gathered at the northern borders of the Gaza Strip to take part in protests, in an attempt to break the siege imposed on the Gaza Strip. Israeli war boats opened live fire, rubber-coated steel bullets and tear-gas bombs, to suppress protesters and boats attempting to break the siege. 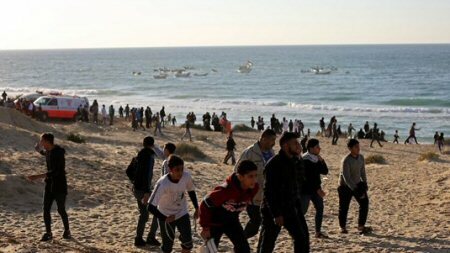 Twenty boats, along with hundreds of Palestinian protesters, had set off from the Gaza seaport towards the Israeli “Zikim” beach, according to Ma’an. Many attempts have been made throughout the years to draw the public’s attention to and break the ongoing siege of the Gaza Strip whether via ships attempting to sail into Gaza or ships attempting to sail from Gaza.